1. I received an email/postcard/phone call from a company asking for my personal information. They said they were working on a directory for Georgia VFW. Is this a legitimate project, or is it a scam? We have partnered with PCI (also known as Publishing Concepts) to produce our new members directory. PCI is a company located in Dallas, TX that publishes directories for educational institutions, fraternities, sororities and military organizations across the nation. This project allows Georgia VFW to receive important updates to our database so we know more about our members and how we can better serve you and future members. a. 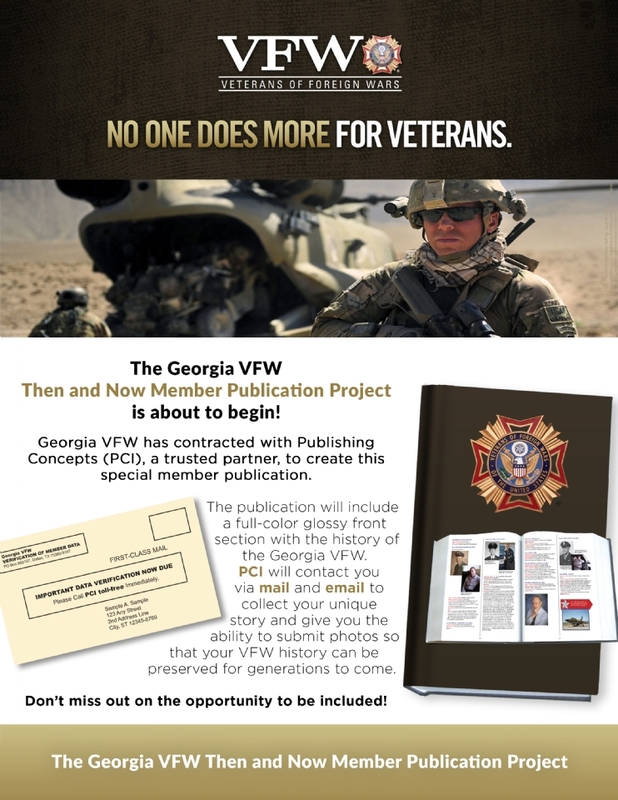 The names, addresses and information provided to PCI by Georgia VFW for the publication of the Directory will be held confidential by PCI, except to the extent that they are utilized in, or in the preparation of, the Directory and except as required by court order or law. b. The Directory will be made available only to members of Georgia VFW. Upon completion of the project, PCI will return to Georgia VFW any and all electronic files that have been supplied by Georgia VFW or produced by PCI in connection with the production of the Directory. If you have received a postcard or an email with a telephone number, you may call the number to speak with a dedicated representative for the Georgia VFW project. The representative will verify all the information we have on file for you and make any updates where needed. The Georgia VFW members Directory is available for sale only to Georgia VFW members. When you call to update your information, you can tell the representative what information you would prefer to have excluded. You may also communicate this information to the PCI customer service desk (1.800.982.1590) or to the Department.